Add charm and personality to your home with custom-created pieces. Custom millwork can be a home’s most defining feature. From shutters and brackets on the outside of a house to crown moldings and cabinets within, millwork is a way to express personality, add beauty and make your home your own. What should you think about when considering custom millwork? Here are a few places to start. Glade recommends exploring styles of millwork that complement your house’s period or style: for example, choosing a Craftsman-style kitchen for a Craftsman-style home, or classical moldings for a Queen Anne-style construction. Relying on a single style throughout is the easiest way to keep a home cohesive. Bottom line: Find a style you like, and decide whether it will work with your space. The wood you choose for your custom millwork will have a huge impact on the pieces’ final character. “There’s an incredible range of options, both natural wood and manufactured,” Glade explains. Specialty woods, like cypress, can lend a unique touch. For a more raw, natural look, reclaimed wood is excellent. Reclaimed heart pine, in particular, is especially good for flooring, as its age makes it harder and more durable than younger pine. That’s not to mention that reclaimed wood tells a story. Consider whether you plan to paint or stain. If painting, you may choose a manufactured wood option, like medium-density fiberboard. Staining can add warm or cool tones to your base wood, setting the tone of a room. Bottom line: Your designer or project manager can help you find an option that fits both your home and your budget. 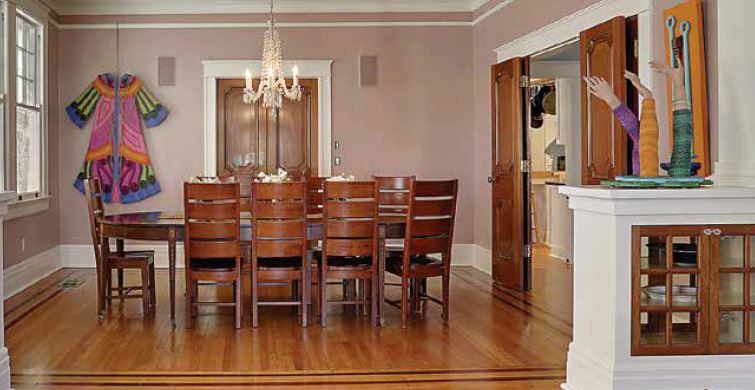 One of the benefits of custom millwork is the ability to accent or downplay areas of your home. Scale is a huge factor in this type of visual manipulation. For example, to avoid the effect of your home’s high ceilings dwarfing your kitchen cabinetry, you’d size up the cabinets. On the other hand, you can use more ornate millwork pieces to draw attention to areas you love, like a central fireplace or a big, gorgeous window.